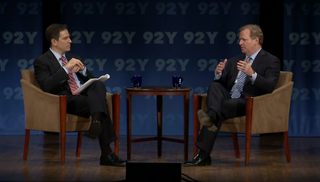 At a public forum at Manhattan's 92nd Street Y last night, NFL commissioner Roger Goodell sounded optimistic that the league's competition committee will soon approve an expansion of the playoffs to 14 teams, with the extra games possibly held on Friday or Monday. Adding a seventh team to each conference as a third wild card "is under serious consideration," Goodell said. It'd be easy enough to tweak the current playoff format by taking away one of each conference's first-round byes, and having that 2-seed play the 7-seed. Goodell formally has no say in the matter, but after touting the excitement of Week 17, in which nearly every game had playoff implications, he sounds like he's all for playoff expansion. "That's extraordinary and we want to keep that. If we could increase that, and again this is about believing in better, can you make it better, can you make those races better by adding two more teams? That's compelling and that's what we're looking at." More football, more playoff football, can only be a good thing. (Disagreements are welcome down in the comments, but you're wrong.) But where do you cram in two extra games to an already-packed wild card weekend? It'd be possible to have early, late, and night games on both Saturday and Sunday, but Goodell raised the possibility of something more unorthodox. "They're going to study some aspects of that because when would those games occur and one team would get a bye in each conference and you'd have six games on the weekend. So would you have three on Saturday, and three on Sunday? Or do you get one on Friday and two on Saturday and two on Sunday and one on Monday? I think those are the kinds of things we want to evaluate." Remember what I said about more football being good? Yeah, I don't want to watch a playoff game on a Friday night. But a cold January Monday night, when there's nothing much else on the sports calendar? Sounds perfect, and we're already conditioned for Monday night football. No one asked me, but I'd prefer two games on Saturday, a full slate of three on Sunday, and a single Monday game. Playoff expansion seems inevitable, and probably to 16 teams some day soon. It means more money, and the NFL has room to grow without extending the actual length of the postseason. The NBA and NHL playoffs are interminable, while baseball has been able skirt the point of diminishing returns by adding first a five-game series, then a single play-in game, keeping the entire postseason under a month. If the NFL can cram more games into a weekend without having to add a whole new week, it's going to happen. What's not likely to happen: a change in the league's seeding procedures. Every year some 11- or 12-win wild card is forced to go on the road to play a weaker divisional winner, but that's exactly how the NFL wants it. "I don't think there is momentum for reseeding," Goodell said. "There might be momentum in the media, but the first objective of any team is to win your division, and when you win your division, you should have a home game."